The strong threads of family and faith run throughout this unabashedly sentimental story of one family's immigrant experience...heart-tuggingly emotional. Lynch's idealized watercolors are dramatically composed...Aside from being a story that has relevance for many, this could be used to personalize a discussion of immigration issues both historical and current. A touching tale. . . . The stunning paintings by P.J. Lynch beautifully convey the courage and hope that are part of the universal immigrant experience. 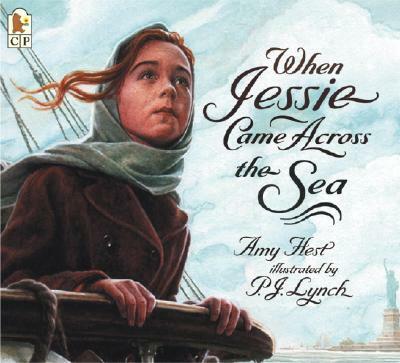 With this tale of a 13-year-old girl's journey from a shtetl in Eastern Europe to America, Hest simply and faithfully holds a mirror to the milestone event for millions of turn-of-the-century immigrants...The subtle, emotional exposition is enriched by Lynch's dramatically charged watercolor and gouache illustrations. The candlelit and sunlit compositions express the yearnings of the immigrants; their faces form a study in hope, loss, and dignity. A compassionate, heartening view of an archetype.